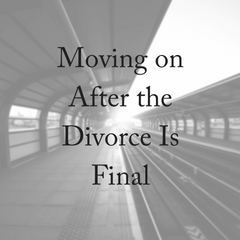 For many people, moving on after divorce can be very difficult. How do you move forward when sometimes you feel like your world has stopped? The good news is that this too will pass, and you will find yourself able to heal from the pain of divorce. Healing from divorce is not linear. It comes in waves, it’s different for everyone, and it’s unpredictable. And while that’s hard to swallow, it helps to understand because you can be prepared for setbacks, and know this won’t last forever, but you can’t force it, no more than you could force marriage. Healing from divorce takes time. How much time? No one knows precisely but some experts claim that after the loss of a marriage, people should give themselves two years to recover. And if you were blindsided by the event, it could take longer. Knowing that moving on after divorce is often both a physical and emotional reality, how can you prepare yourself? The process may look different from person to person and relationship to relationship. We are, after all, each unique and our relationships always reflect the same. 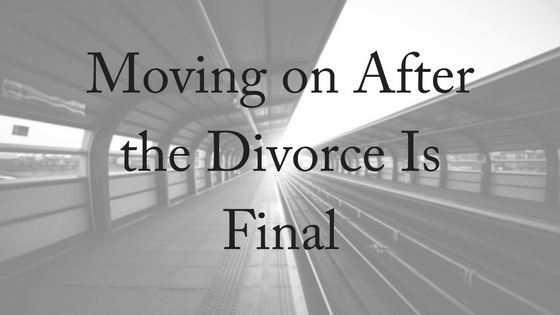 Moving on after divorce takes time, but it also takes a bit of work. Change from our present state can only happen if there is some kind of movement and for that movement to be forward it often entails delving into the hurt before our hearts can heal – getting rid of the old, decaying flesh, before the new living flesh can grow and thrive. Seek solace. The comfort of family and friends is very important at this time. Seek them out for solace, rather than turning to solitude. Although personal reflection can be very helpful in moving on, too much of it can be a hindrance, especially if our self-talk becomes negative. This leads to our next step. Don’t wallow in guilt. The past cannot be changed, no matter how much we wail and weep about it. Many divorced people feel guilty because their marriage has not worked out the way they had hoped or dreamed it would. In fact, it’s not just loss that they feel but also grief at future dreams shattered. It’s also very common for divorced parents with children to feel guilty over the very different landscape they’ve landed their children in. Take control of your finances. If it wasn’t your ‘thing’ before you were separated, you don’t need to become a guru overnight, but you do need to make sure you are in control of your finances and not the other way around. Doing this well can go a long way to empowering you to move on as an individual. Don’t jump into dating. Give yourself time to heal instead of using another person to cure your loneliness and cover your hurt. It’s not helpful for you and it’s not helpful for them. You also need to give your children time before you bring someone new into their life. Change your home quickly or change it slowly. There’s conflicting advice out there about this. What should you do? You need to think about whether moving out of the marital home is best for you and your children in moving on or would it be wiser for you to stay? There are financial considerations here as well as emotional ones. The home you lived in as a married couple will remind you of those times and could be a hindrance for you. Or, staying may mean greater stability for your kids. Whatever you do, make a decision that’s not rushed and seek the advice of wise family and friends. 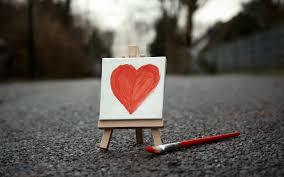 Keep doing what you love doing (or find something that you do). Having a hobby or interest is good for us. Don’t neglect spending time on yourself by doing something that brings you joy or a sense of satisfaction. It will help your brain to not fixate on your divorce and will make you a better mother or father because your time out is likely to energise you for the more mundane tasks. Moving on after divorce can be made easier if the divorce itself is handled in a low-conflict manner. We act to make your divorce as low-conflict as possible, always keeping in mind the best interests of your children. If you would like to speak to one of our experienced family lawyers please contact us today! We offer a free, 10-minute phone conversation.